(Juh-zeer-uh Lee-yen-uh) A young woman with dark brown hair that is long and straight. She has golden brown eyes, and her ears are similar to an elf's, yet they are pointed in two places near the top of each ear. She is slight of build, yet far from seeming weak. Her upper torso, along with her arms and hands, are human. Her lower torso is that of a dragons, including her tail. 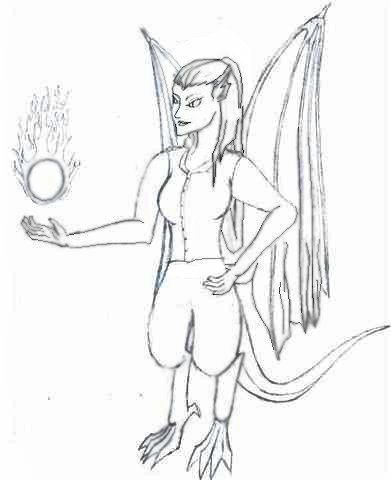 She has large draconic wings that sprout from her back as well. 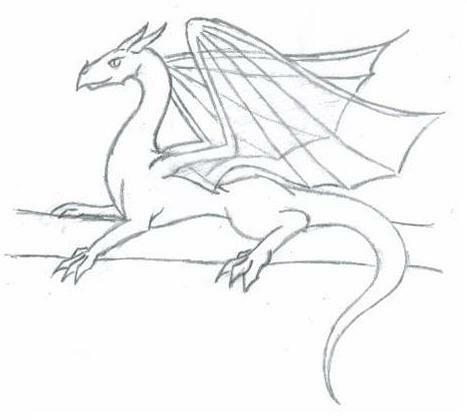 Her legs, wings and tail are silver, and her skin a medium tan. "My name is Jazira. I come from another world, nearly as rich in culture and race as this one but still torn from a time of war. That is a story for another time, however. I emerged in this world without knowing how I came to be here. By helping a ghostly woman, I was able to learn a bit about this place and myself, but I am still trying to learn all I can here. My abilities lie in magic and shapeshifting. I can control four of the elements of nature - Fire, Water, Earth, and Air. Energy is the element I am not so comfortable with, though it is not a weakness of it, but rather...well, it is a story for another time. I am also a shape shifter, meaning I can change my body, or parts of my body to suit my needs. I do not have to see or touch an animal to shift into it's likeness, but if I can see it in my head, I can shift into it's body. There is a catch to my shifting, however. I cannot take another person's face. My face will always remain the same face I have now. The same goes with color of skin, scales, and fur - it will always be Silver or dark brown. I have one other ability - healing, but not with magic. I heal very quickly - within moments - from normal injuries such as cuts, bruises, and broken bones. Toxins, poisons, bacteria, diseases or other such things take a few days to heal, however. Blood from my heart can cure all physical wounds almost instantly. However, it can be a very painful experience on both parts. I have not yet tried needles, but the needle would have to be long and strong enough to enter the injured person's heart from the chest. That is the only way the Blood will work. It cannot bring a person back once they have died, and trying to do so can be quite... disasterous. I have gained a small army of creatures who fight for me and are very loyal. I have also found a great many friends and making new friends every week I spend here. I have defeated the guards at Willow's Shop, and am working hard on a ritual to defeat the Lorerootian Guards. I advanced to MP4, defeated the Guards at Loreroot's entrance, and now I am working on restoring the Savelites Church Alliance. It is challenging to say the least, though I am very pleased with the support I have received from fellow peers. 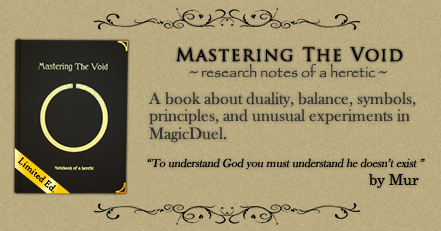 Mission Statement: The Sisterhood's mission is to support Magic Duel in all fun activities that brings the populace together as whole. The following Sisterhood rules are not to be taken seriously. 1. You must be willing and able to smooch the men of MD indiscriminately..
2. You must be willing to share your weapons and other nasty toys with your sisters when asked..
3. You must be able to fight like a man but still look and smell like a woman. 4. You must be able to smell a bargain a mile away. 5. You must know all the Champions and have smooched them at least once. 6. You must take turns slurping your drink loudly, when with your Mistress and/or other sisters. 7. You must know how to play the Snicker game. 8. Pay attention to the Mood Panel for collective instruction. This rule is absolute! 9. You must read the forum for all SISTERHOOD related information. This rule is to be taken seriously!! 15. Sister Devie - New!!! ADAM ICEPHOENIX, WHITE REAPER, GREMLIN, YOSHI, MALICHIW, ROCKISTAH, FLAMEWARRIOR, BLACKER & ROLAND.